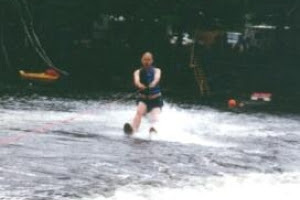 Learning to water ski at age 30, my Dad proved just why Swedes are known for being stubborn. Most of our family vacations were within 20 miles of my home town of Derby, Maine, and the photo here was on Sebec Lake. One year my father decided to give her a try. He got into position with his signature King Edward’s cigar hanging from one corner of his mouth, and sat back with the tow rope between the 2 tips of the skis. Giving the thumbs up, off he went, or almost. For whatever reason he went under as the boat took off, and was completely submerged and plowing water. Being tough and stubborn, he wouldn’t let go and was dragged about 15 feet like a submarine, and then popped up skiing like a champ. After a few loops around the lake the boat finally made a swing near the shore. To our surprise, the stubborn rascal still had the cigar.